Civil War Director Says Bringing Netflix Heroes to Infinity Wars Is "Complicated"
In a recent sit-down at Comic Con Experience, Captain America: Civil War co-director Anthony Russo laid out the complex realities of bringing all of Marvel's heroes together on the big screen. With this year's Avengers: Age of Ultron featuring some 15 characters in the "top-billed cast" alone, you'd think that Marvel would have a hard time finding any more room to pack cameos and bit parts into their future cinematic efforts. Masters of synergy though they have become, it's safe to say that the MCU is reaching a critical mass in regards to the pure number of superheroes that occupy it, and the results (at least recently) have largely felt less like fully-realized stories and more like 3-hour cross-promotions for their next "chapter" or "phase" of products. And yet, there is still a demand for more. Next year's Captain America: Civil War, for instance, will feature an astonishing 16 comic book characters making appearances -- from Steve Rogers himself to Antman all the way down to Brock Rumlow/Crossbones (played by the always excellent Frank Grillo). 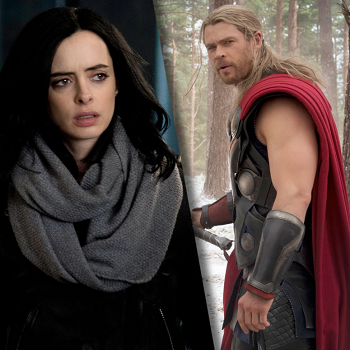 How directors Anthony and Joe Russo plan on giving each of these characters something to chew on remains to be seen, but in any case, fans are already wondering if they are going to be able to somehow up the cameo ante in the Avengers: Infinity Wars sequels planned for 2018 and 2019, respectively. During a recent appearance at Comic Con Experience 2015, Anthony was asked by Brazilian publication Super Interessante about the likelihood of seeing any of Netflix's Marvel superheroes -- Jessica Jones or the upcoming Luke Cage, for instance -- in Infinity Wars. "When we start to serialize the telling of stories it's difficult. You have to have a lot of control and focus on the course of history. The films are controlled by a group led by Kevin Feige, so they function as a unit." "Other products, even if they are from Marvel, are controlled by others," he continued. "Then there is the possibility of a crossover, but it's more complicated. It is a smaller scale version of the problem that exists when remembering that Fox holds the rights to some of Marvel's most popular characters, as does Sony and others. As storytellers, we only have control over what happens in Marvel movies, but everything is possible, Spider-Man (whose rights were held by Sony) became possible!" It's a pretty understandable setback, given the incredible breadth of Marvel's recent outputs. With 23 movies and TV shows currently in various stages of development, it seems that Marvel execs might be tripping over their own red tape when it comes to the legality of future crossover efforts. Still, if you think they are running out of ways to keep fans flooding to the theaters, then Age of Ultron's 1.45 billion dollar return would like to have a word with you.